Description: Our Luxury cushion pads are individually hand made in our Sussex workshop by our team of skilled seamstresses and craftsman. In a range of ethically sourced feathers, eco friendly wool and allergy & vegan friendly fibres. 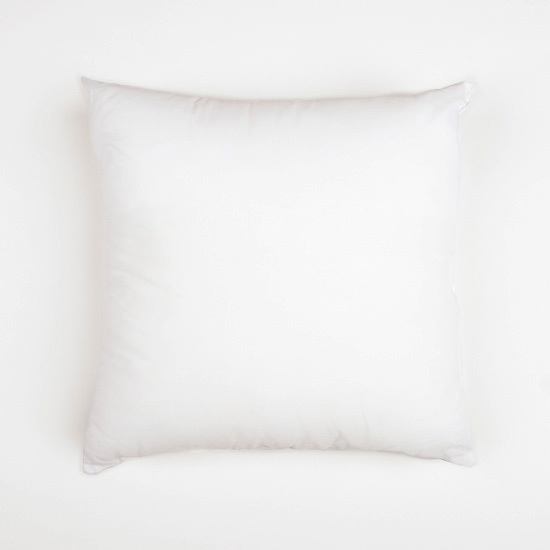 Our fillings are sourced for their superior quality and properties to make only the finest quality cushion pads. Full product specification and details of our fillings below. Product code: CW-SCP-16. Category: Square Cushion Pads. Please note you will need to order your cushion pad 1inch / 2.5cm larger than your cushion cover to make it look plump and push out the corners. Find out more about the cushion fillings. 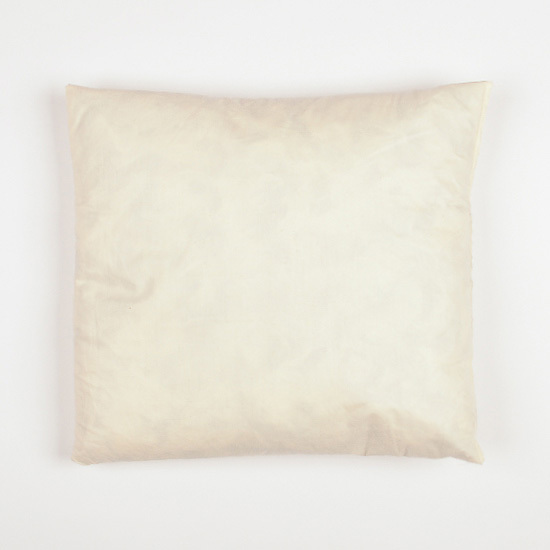 Natural fillings cover: 100% cream cotton cambric, waxed to prevent protruding feathers. Synthetic fillings cover: white poly cotton. Ordered these cushion pads as I like to buy locally wherever possible. Product (Cluster fibre filling) is excellent quality and very “plump”. However, rather disappointed with customer service and communication, and lead time. After a week I emailed to find out when they were likely to be ready as I needed them for a specific date. After 3 emails, I did eventually get a response to say they were ready. I’d used “click and collect” as I live fairly near to the workshop, but didn’t get a very welcoming response when I arrived, and felt they didn’t really like customers collecting their own orders! However, I would use the company again because of the quality and value of the products, but in future would be prepared for a slower than average delivery. Having spent time and a lot of money having some fabric printed with original lino/wood prints for cushion covers, I was delighted that I spent the time to find The Cushion Warehouse for the pads to fill them! The sizes are great and the pads soft and well made. I will be putting in another order soon!! Purchased wool. Impressed with the quality. Pleased I ordered one size larger! Purchased the luxury cluster fibre, great product, has stayed nice and plump even after use unlike many other cushions I’ve purchased online before. Very fast delivery. Would highly recommend. This is the second time I have purchased the hollow fibre cushions. They are great quality giving a plump firm cushion. I like the range of sizes; there is bound to be a size that fits. I thought the postage was a bit expensive for two pads but as the quality is so good I had no hesitation in going ahead with the purchase. Purchased in Wool. Lovely plump cushion inner for my tapestry cushion. It does smell of lanolin, but that is a lovely smell and is in no way overpowering. I followed the advice of ordering a size larger than the cushion cover and this has worked a treat to create a full cushion. Very pleased, thank you. Three stars because delivery service by courier is awful, ten days not acceptable these days. Postage high as well, however wool filled cushions extremely good and I can’t find them elsewhere. Purchased in Hollow Fibre. Just the job to revive some very flat sofa cushions. Very happy and very pleased to see they are made in the UK as well. Purchased in Wool. Bought 6 cushion pads lovely and plump, good service as well. I bought 4 of the 16 by 16 hollow fibre cushions and they were amazing. Lovely a plump and were perfect for the project I was working on. Definitely would purchase again. These are the 2nd lot of luxury cluster fibre cushions I have bought from this site and they are far superior to ones I have purchased elsewhere for a similar price. Great quality and excellent value for money. Will highly recommend this company. I am very pleased with the hollow fibre 16″ pads I bought. They are well made, plump and the size measure is accurate. Would definitely recommend. I purchased four of the duck feather and four of the duck feather and down. They arrived well packed. They are both good cushions, well made, plump and soft, yet firm. I can’t really tell much difference betwen the pure feather and the more expensive feather and down to be honest, though perhaps this will become clearer with more use. They are all certainly much better than the cheap, lumpy pads they replaced. Purchased in Hollow Fibre. Oops! These were the items that I purchased four of to replace some very worn-out feather pads with and they have really revitalised and given a whole new lease of life to my cushions which are, now, thanks to the guide to order a size larger than the actual cushion, much more supportive, too! Nice to see my name on the labels which suggest that these are manufactured to order, too! Excellent quality, I got the polyester and it’s soft, fabric is smooth and wonderful, super high quality filling, I was actually surprised at how high the quality was for the price! Purchased in Cluster Fibre. Excellent quality, exactly what I needed and very speedy, hassle-free delivery. Very impressed, will definitely look up The Cushion Warehouse again. 16×16 inch luxury square pad bought. The product feels lovely. The sizing advice was particularly useful (and accurate). I thought the cost of postage was a little expensive, but, I now have two lovely cushions. Purchased in Luxury fibre. Great product and customer service, thank you.